Cracked Ice and Chrome · It’s cool! It’s refreshing! It’s a retro font! It’s cool! It’s refreshing! It’s a retro font! October 3, 2009 in Retro finds! | Be the first to comment! Went shopping at a local store the other night, and when I got home I pulled out all the coupons they had stuffed in the bag. 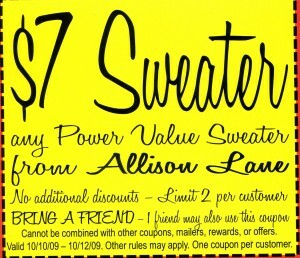 Imagine what a pleasant surprise it was to see that the store implemented some nifty fifties’ fonts for their coupons. 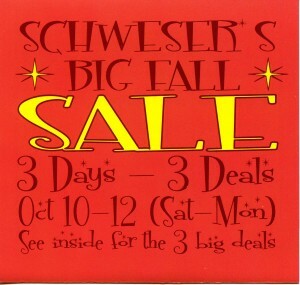 Way to go, Schweser’s! If I’m not mistaken, this font comes from FontDiner.com. It’s called Fontdinerdotcom Sparkly. Get it here. If you’re a retro font enthusiast, you will LOVE this site. Lots of fonts that make you wish they never went out of style. Y’know, it makes me wonder why distinctive lettering has been almost universally traded in for the incurably bland. Think of the logos of almost any national store — they’re all blocky Impact-type lettering that has no sense of style whatsoever. Walmart’s signage? Boring. Target? The most distinctive part of that sign is the target itself. K Mart? Equally bland. Kohl’s? Blah. Even brand names have begun to trade in their distinctive lettering for the banal. Pepsi has been aggressively chiseling away at its script font and has reached new lows with its all-lowercase current model. Kudos to Coca-Cola, which still uses its original script lettering. Will the old fonts ever make a comeback? Who knows, but I’m seeing little bits and pieces of them returning in small ways. After all, the old is always “in” again at some point, is it not?